Variant cover for War Machine #1. Art by Mike Deodato. The Titanium Man ("Chelovek-Titan") is the name of two fictional supervillains appearing in American comic books published by Marvel Comics. The original Titanium Man first appeared in Tales of Suspense #68 in 1965 and was created by Stan Lee and Don Heck. Despite his failures, Bullski was in favor with the Soviet government once more, and returned to the United States on a mission for the KGB. By threatening the parents of a Soviet defector named Sergei, he forced the man to design technologically advanced armored suits that could be transformed into small card-like objects. Posing as "the Commander", Bullski used the suits to equip members of the Green Liberation Front (G.L.F. ), an organization of disaffected Vietnam War veterans who felt ignored by their country. With the suits, the G.L.F. robbed a New York City bank and the Federal Reserve Bank of New York; though the members believed that they were simply acting as thieves, Bullski used the robberies as a cover for implanting a computer virus that would destroy American financial records, causing chaos in the economy of the United States. Beta Ray Bill and Sif opposed the G.L.F. and the Commander, but when Sergei discovered that his parents were dead he exposed Bullski's true identity and the angry members of the G.L.F. turned on the Titanium Man. Teleporting away, he rematerialized in card form, which Sergei then simply tore and threw away. Sometime later, the new Crimson Dynamo was sent to the United States by the Soviet government to retrieve the remnants for reintegration. The G.L.F. discovered the Crimson Dynamo's mission and attacked him, forcing him to seek assistance by reactivating the Titanium Man, who due to the incomplete nature of his reassembly was still missing body parts. Enraged, Bullski slaughtered the members of the G.L.F., and was only stopped when the Dynamo lured him over the Atlantic Ocean and returned him to card form. Bullski was later restored and continued to serve as Titanium Man, as a member of the Soviet Super-Soldiers and later Remont-4, but felt increasingly despondent as the Soviet Union declined. After an attack on a Stark Enterprises factory in Russia he was believed killed while battling Tony Stark, who was wearing Crimson Dynamo armor that was being controlled by Colonel General Valentin Shatalov, a former friend of Bullski. Sometime later, during a space mission to destroy an enormous asteroid that threatened to impact on Earth, a Titanium Man, stated his name was Andy Stockwell (revealed to be an alias to Bullski), and had never had a connection with the USSR. However, moments later it was revealed he was actually a member of "The Hammer", an international network of communist sleeper cells who wanted to destroy the United States. He was lost in space, but being relatively close to Earth, may have returned under his own power. Now a mercenary, Bullski was hired by Tony Stark to fake an attack on Congress trying to show reasons to stop the superhuman registration act. He battled Spider-Man there and made a withdrawal after Spidey damaged his helmet with his cybernetic claws, but not without saying to a camera in Spider-Man's Iron Spider suit a planned talk which Stark used in the Congress in rejection of the SRA. The Titanium Man reappeared, this time in Russia, as a member of the rogue Soviet super-rebel group called Remont Six. He was knocked out by Darkstar, but was apparently not captured. Some time later Titanium Man was seen being beaten down by the Protector. The identity of this Titanium Man or the circumstances of the battle remain undisclosed, but he is presumably Bullski, because he was wearing that version of the armor. During Doctor Octopus's latest scheme, Octavius contacted the Titanium Man as one of several villains to assist in his plans after two of the Sinister Six were defeated, but this backfired when the Titanium Man contacted the Black Widow to warn her about the villain's current schemes, defining himself as a Russian patriot rather than an American villain, and obeying Spider-Man's call to rally other heroes against his foe. When Titanium Man entered one of Doctor Octopus' facilities, he was defeated by Scorpion despite his best efforts. The second Titanium Man was Kondrati Topolov, the mutant formerly known as Gremlin, and served with the Soviet-era superhero group, the Soviet Super-Soldiers. The Gremlin was killed in combat with Iron Man during the first "Armor Wars" when the titanium in the suit exceeded its combustible temperature. The third Titanium Man's identity is the subject of some controversy. The first time this figure manifested itself, he attacked Stark Enterprises and Iron Man directly, apparently under orders of Stark-Fujikawa (possibly as a mercenary). While he was shown to cherish Soviet paraphernalia and newspaper clippings featuring Boris Bullski, his identity was not firmly established. Sometime later, during a space mission to destroy an enormous asteroid that threatened to impact on Earth, a Titanium Man, claiming to be this same person, stated his name was Andy Stockwell, and had never had a connection with the USSR. However, moments later it was revealed he was actually a member of "The Hammer", an international network of communist sleeper cells who wanted to destroy the United States. He was lost in space, but being relatively close to Earth, may have returned under his own power. A Titanium Man was contacted and hired, ostensibly through the Hammer again, to do a mercenary job for Tony Stark in his effort to stop the superhuman registration bill. Recently, the Titanium Man reappeared, this time in Russia, as a member of the rogue Soviet super-rebel group called Remont Six. He was knocked out by Darkstar, but was apparently not captured. In the same period, another Titanium Man was seen being beaten down by Noh-Varr. The identity of this Titanium Man or the circumstances of the battle remain undisclosed. A Titanium Man was among the Iron Man villains recruited by Mandarin and Zeke Stane to assist in a plot to take down Iron Man. During the Infinity storyline, a Titanium Man is among the villains recruited by Spymaster to help him attack the almost-defenseless Stark Tower. Titanium Man attacks Blizzard and Whirlwind when they try to abandon the mission. During the fight, it is revealed that Titanium Man is the Kree Captain At-Lass who was sent by the Kree to steal Iron Man's armor. The Titanium Men used green armor similar to that used by Iron Man and to that used by the Crimson Dynamo (their sometime compatriot). Neither suit of armor was as sophisticated as that used by Tony Stark as Iron Man, but some of its weapons were deceptively powerful, and the first Titanium Man's physical strength seems to have been greater than that of Iron Man. He also boasted that his armor was made to last, not, like American technology, "with planned obsolescence" (although he had actually received several significant upgrades himself). The suit of armor increases the wearer's physical strength to superhuman levels, and is in fact stronger than Iron Man. It was also able to fly at supersonic speeds (it can even reach escape velocity), shoot concussive force blasts from the hands, project constrictive force "rings", fire an electromagnetically paralytic beam from the helmet, and was resistant to conventional artillery. Boris Bullski, the original Titanium Man, also possessed enhanced strength due to treatments given to him by the Soviet government to augment his physiology, making him grow into an 11-foot-tall giant. The Gremlin, being a dwarf who seldom exercised, was weaker than most people, but he possessed super-human intelligence, was capable of creating advanced devices and weapons, and was an accomplished genetic engineer. A Soviet Titanium Man, developed for the Russians by Victor von Doom, proved the better of the Iron Man prototype. Later, the same individual was shown, together with the Crimson Dynamo, as a free agent working for HYDRA. This Titanium Man was physically similar to the original mainstream version. He is later killed by Doombots along with Crimson Dynamo and Black Knight. In the House of M reality, the second Titanium Man was seen as a member of the Soviet Super-Soldiers. 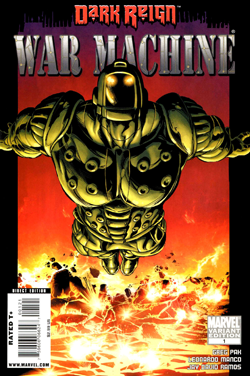 The Ultimate Marvel version of the Titanium Man is Howard Stark Sr. when the character was featured in Ultimate Comics: Armor Wars, although parts of him resembled Iron Monger as well. Another Titanium Man appears in the pages of Ultimate Comics: Ultimates #18. Jake Miller was employee of the Crystal Lake Energy Complex. During the Hydra attack to the United States (in the "Divided We Fall" storyline), he volunteered to enter the unattended nuclear plant in order to take control and prevent a catastrophe, but his family was killed by Hydra soldiers while he was away. In despair, Miller built a titanium armor using Quark-based pirated technology, and led to the nuclear plant in order to blow it up in revenge of the country. He was stopped by the Ultimates, who convinced him to surrender. Titanium Man appeared in the Iron Man portion of The Marvel Super Heroes voiced by Ed McNamara. Titanium Man appeared in the Iron Man animated series voiced by Gerard Maguire. In "And the Sea Shall Give Up Its Dead", he's shown as a powerful minion of the Mandarin and a creation of MODOK. Titanium Man is thrown into space by Iron Man. Titanium Man does not make more appearances during the first season. In one chapter of the second season, Titanium Man makes an alliance with Dark Aegis, but at the end he helps Iron Man and War Machine, sacrificing himself in order to stop Dark Aegis, as Titanium Man was disgusted with Dark Aegis's genocides on multiple planets. Titanium Man first appears in the Iron Man: Armored Adventures episode "Titanium Vs. Iron." This version of the Titanium Man armor is operated by a 21-year-old version of Justin Hammer. Titanium Man was mentioned on The Super Hero Squad Show episode Tales of Suspense. The Boris Bullski version of Titanium Man appears as a boss in the 2008 Iron Man video game (based on the film of the same name) voiced by Dimitri Diatchenko. In the game, he is an agent working for A.I.M. In the PSP version of the game, the Titanium Man armor can also be unlocked as an alternate costume for Iron Man. The third Titanium Man appears as a boss character in Marvel: Ultimate Alliance 2 voiced by Crispin Freeman. He orchestrates a terrorist attack on Washington, DC. Titanium Man is featured as a boss in the Facebook game Marvel: Avengers Alliance. Titanium Man, based on his animated appearance, was part of the Toy Biz Iron Man toyline. Titanium Man, based on his design from the video game, is featured in the toyline for the Iron Man film. Titanium Man was released in the Iron Man Face Off 4-pack from the Marvel Super Hero Squad line, packaged with figures of Iron Man, War Machine, and Crimson Dynamo. A repaint of that figure was released in the Armor Wars: Part II 3-pack, packaged with Iron Man and Crimson Dynamo. A figure of Titanium Man was released in wave 32 of the Marvel Minimates line. A figure of Titanium Man in his Mark II armor was released in wave 2 of Hasbro's 3.75" Iron Man 2 movie tie-in line. A figure of Titanium Man was released in wave 1 of Hasbro's 6" Iron Man: The Armored Avenger Legends Series line. Titanium Man is mentioned in the Wings song "Magneto and Titanium Man", which was written and produced by Paul McCartney. The song also mentions the Crimson Dynamo. This page was last edited on 16 February 2019, at 14:48 (UTC).